The Chevrolet Equinox is one of the most popular small sport utility vehicles on the road today. That's due, in large part, to the way this vehicle is designed. The Equinox is a great combination of form and function. It's a great way to haul people or gear. It gets an average of 39mpg on the highway. 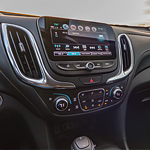 The Chevrolet Equinox is a marvel of design. It starts with the sleek, aerodynamic exterior. The athletic stance isn't just posturing. It accounts, in part, for this small SUV's great gas mileage. The interior seats 5 adults comfortably. It can also accommodate 63.9 cubic feet of cargo. The Equinox can also tow up to 3500 lbs. Of course, the best way to really understand all of this is to drive the Equinox for yourself. Come see us at Ramey Chevrolet Tazewell. We'd love to put you behind the wheel of one of these great, sporty vehicles.